This super green salads is packed full to the brim of goodness and the spiced oaty sprinkles add a welcome kick of flavour and crunch. To make the spiced oats, add the egg white and soy sauce to a mixing bowl and whisk together for a minute or so until pale and foamy. Add the oats, sesame seeds, chilli flakes and a good grind of black pepper and stir until combined. Tip onto a non stick baking tray, spreading out into a thin layer. Place in the hot oven to bake for 12-15 minutes, stirring halfway through cooking until crisp and golden brown. Meanwhile, place the asparagus onto another baking tray and drizzle over the oil. Season well with salt and pepper and slide into the oven to roast for 6-8 minutes until just tender. 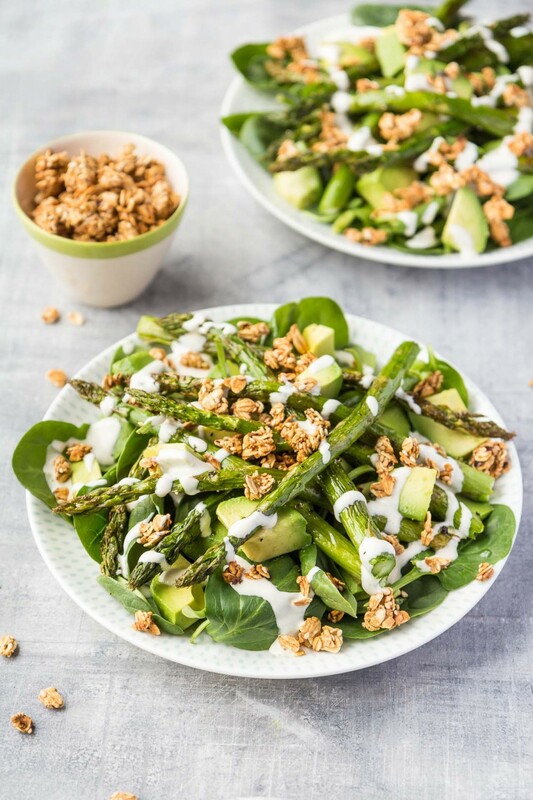 Make the dressing by adding the yoghurt, tahini and lemon juice to a bowl and whisking together with just enough cold water, about 100ml, to made a drizzle-able dressing. Season to taste with salt and pepper. Set aside. Scatter the spinach over a large serving plate, or divide between individual plates if you prefer. Slice the avocados in half, remove the stone and peel and chop the flesh, scattering over the spinach as you go. Top the salad with the roast asparagus and drizzle over the dressing. Finally scatter over the crunchy oats and serve immediately whilst the asparagus is still warm.